All presented information was gathered by reading the protocol specification ([MS-DNSP], https://msdn.microsoft.com/en-us/library/cc448821.aspx) and reverse engineering the dns.exe binary using IDA. The management protocol layers on top of RPC, which, for this protocol’s purposes, can be layered on top of either TCP or named pipes. If you’re interested in messing around with the protocol or its implementation, it can be found in domain controllers under c:\windows\system32\dns.exe. Its RPC interface UUID is 50ABC2A4–574D-40B3–9D66-EE4FD5FBA076 and it uses the \PIPE\DNSSERVER named pipe for transport. By default only DnsAdmins, Domain Admins, Enterprise Admins, Administrators and ENTERPRISE DOMAIN CONTROLLERS have write access on this object. 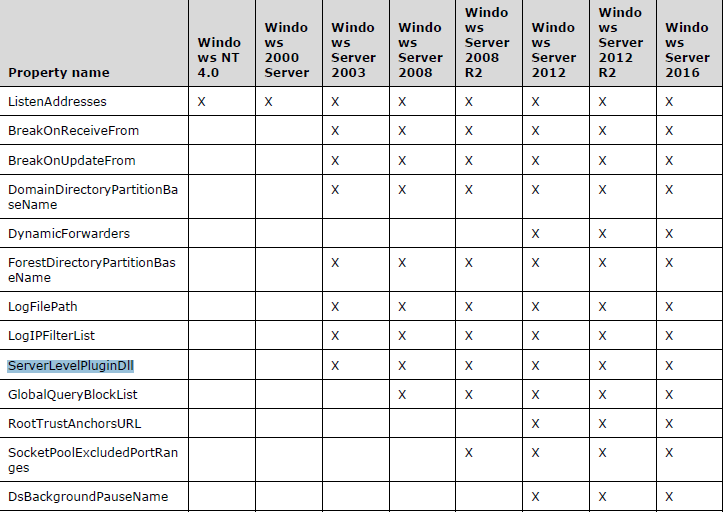 Notably, from an attacker’s perspective, if we’re members of each group but DnsAdmins, we’ve already owned the domain. So, let us see what we can do if we’ve got ourselves a DnsAdmin. Looks like the server does not even do any verification on the dll path specified in this operation. Before starting to implement this, I figured someone must have dug this up before. A google search for ServerLevelPluginDll raised nothing of the sort, however it did pop up the useful dnscmd command line tool, which I hadn’t known before. 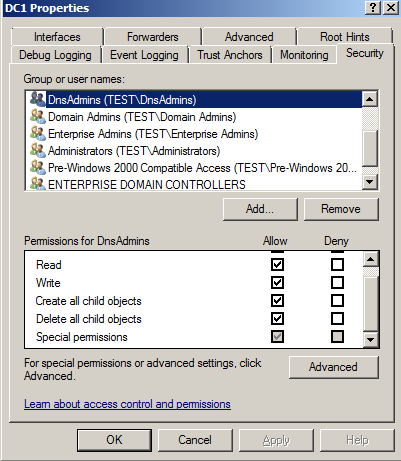 First, trying to run this as a weak domain user with no special permissions on the DNS server object (other than Generic Read, which is granted to all members of the Pre-Windows 2000 Compatible Access group, which by default contains the Domain Users group), the command fails with an access denied message. If we give our weak user write access to the server object, the command no longer fails. This means that members of DnsAdmins can successfully run this command. Great. Now, for testing purposes, we restart the DNS server service. Whoops — it fails to start, and clearing the registry key value allows it to start. Apparently it needs something more from our DLL. Time to open IDA. There are several possibilities to quickly reach the functionality we seek to reverse in this case — searching for relevant strings and searching for relevant APIs are usually the easiest and quickest. In our case, going through all xrefs to LoadLibraryW or GetProcAddress gives us what we need — going through the code of the function which LoadLibraryW’s our DLL and the one function it is called from, we see that no validation is performed at all on the path given to ServerLevelPluginDll. The hurdle we’ve run into is indeed the only one — if either the DLL fails to load, or it does not contain one of the DnsPluginInitialize, DnsPluginCleanup or DnsPluginQuery exports, the service will fail to start. We also need to make sure that our exports all return 0 (success return value), otherwise they may cause the service to fail as well. The pragmas are in place to modify the default export names to the ones that we desire. To verify that our exports are good, we can use dumpbin /exports path\to\dll. Now we try running dnscmd with our new dll and voila, it works! All we need is to put our dll on a network path which is accessible by one of the domain controllers’ computer accounts (dns.exe runs under SYSTEM) (Read access for the Everyone SID should do the job), and we can run code as SYSTEM on a domain controller, thus taking control of the domain. While this demonstrates that it is possible to take over a domain if you’re a member of DnsAdmins, it’s not limited to just that — all we need to successfully pull off this trick is an account with write access to a DNS server object. The ACLs for these objects are usually, from my experience, not kept as clean or monitored as ACLs for domain admins (or similar groups protected by AdminSDHolder), thus offering a nice chance for a small domain elevation of privilege. Regardless, dns.exe currently still runs as SYSTEM and boasts a good amount of attack surface, so it is probably a worthwhile candidate for some fuzzing — both for the DNS implementation and the management interface. Mar. 31st — Initial disclosure to secure@microsoft.com. Apr. 1st — Disclosure acknowledged and forwarded for review. Apr. 8th — MSRC case 38121 opened. May 2nd — Investigation concluded and ruled that this is not a vulnerability and will be fixed in the future, outside a security update. May 5th — Discussions regarding further hardening of the DNS server service. May 8th — Findings are published. Big thanks to MSRC’s Daniel for the handling of this case, was a pleasure to work with. Small update (May 10th): Nikhil Mittal has elaborated on the precise technicalities of getting this feature to work in his lab, here. Thank you!